Lush Fab Glam Inspired Lifestyle For The Modern Woman: Personalized Wedding Gifts For The Bride and Groom. Personalized Wedding Gifts For The Bride and Groom. 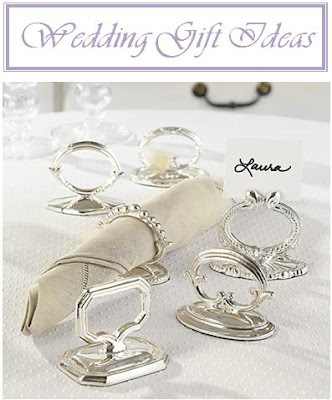 Wedding season is in full swing and Layla Grayce is offering 15% off wedding gifts with promo code 15wed valid through 6/30/12! Below are a few of our favorite wedding gift ideas including heirlooms and gifts personalized just for the bride and groom. Let the bride and groom remember their wedding everyday with the Bella Fiore Frame.This cream colored frame is simply elegant and is accented with a laurel green bow. Looking for a gift that will last a lifetime? The Personalized Wedding Announcement Plate is hand made by an artist and can be personalized with couples names, monogram, or up to 5 lines of text. Create an instant heirloom with the Essex Silver Creamer Set. These petite silver creamers add the perfect touch of personality. Which gift would you get the bride and groom? Leave a comment below. Super cool stuff! I am becoming a fan of personalized weddings stationery.